The Congressional Fire Services Institute (CFSI) is seeking designs for the first national fire service Christmas ornament. We are extremely excited about conducting this contest and developing an ornament that will capture the Holiday spirit and traditions of our nation’s fire and emergency services. Unveiling of the winning design will take place during the 30th Annual National Fire and Emergency Services Symposium and Dinner in Washington, DC on April 18-19, 2018. The winner will receive one free ticket to the program and hotel accommodations for one night at the Washington Hilton. Approximately 1,500 fire and emergency service officials from across the country are expected to attend the program. The design can have a historical significance, or it might capture the image of today’s fire service. It should feature a Holiday theme, and should include (but is not limited to) apparatus, structures, firefighting equipment, or a community setting. Because it should capture a generic image of the fire service, the design should not display a company logo, the names of individuals, organizations or specific jurisdictions (e.g., a state, city or town). The design may be a customized hand-drawing, digital image, or photograph. A design that includes copyrighted or trademarked materials will not be accepted. Each design must be the original work of the submitter. A submission should include a brief written description (no more than 200 words) about the meaning of the design as it relates to the fire and emergency services. Submissions must include contact information for the submitter – including name, phone number, and email address. Click here for the official rules and to submit a design. Deadline for submissions is January 12, 2018. Questions regarding design proposals should be directed to Steven Tramel, CFSI’s Development Manager, at [email protected] or (202) 371-1277. 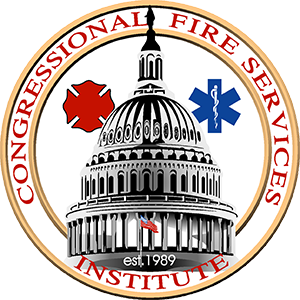 Established in 1989 as a nonprofit, nonpartisan policy institute, CFSI is designed to educate members of Congress about the needs and challenges of our nation’s fire and emergency services so that the federal government provides the types of training and funding needed by our first responders.